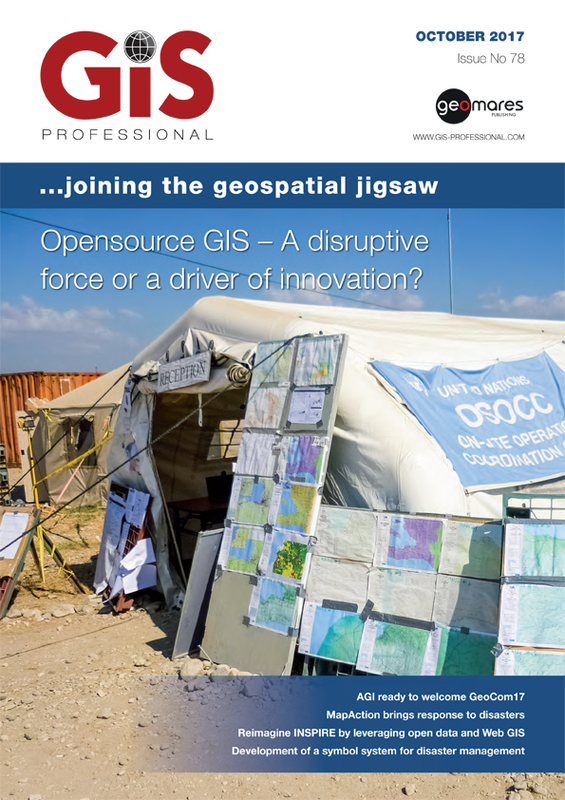 In this issue, Niall Conway shines his light on the increasing popularity of opensource GIS and developments towards the future; Open data is undoubtedly a great movement in the world of GIS with OpenStreetMap and Copernicus being two examples; a look at MapAction which provides rapid on-the-ground mapping to humanitarian aid agencies in response to a disaster; Silvia Marinova describes how a symbol system should be easily used in an emergency; and how the INSPIRE Directive has made good progress toward implementation by all member states. Also, we talk to Suchith Anand, chair of the ICA Commission on Open Source Geospatial Technologies, who established the Open Source Geospatial Lab; a look ahead to AGI’s GeoCom17 Conference and its programme; and a review of the 7th UN-GGIM Conference at the UN Headquarters in New York. Plus all the latest news regular and columns – Happy reading! Page 08: We talk to Suchid Anand, chair of the ICA Commission on Open Source Geospatial Technologies, who established the Open Source Geospatial Lab. Read now. Page 16: Open data is undoubtedly a great movement in the world of GIS. OpenStreetMap and Copernicus are just two examples that open many doors and facilitate new applications. Read now. Page 22: Silvia Marinova describes how a symbol system should be associative and quickly perceived by map users even without the use of a legend, especially in an emergency. Read now.